The other craft the children made in kindergarten was a tri-cornered hat. 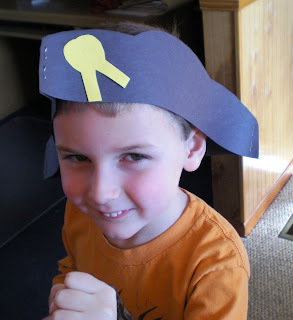 Make a pattern for one side of the hat that the children can trace. I used black paper to make my hat, the kindergarten class used red, white, and blue paper. 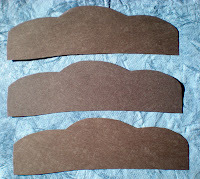 Have the children, if they are able, trace the shape onto the colored paper you wish to use. Then let them cut the shapes out. Use the stapler to staple together the three corners. I glued on a yellow piece of construction paper like a medallion. The class topped it off by putting a "feather in the cap." My kids tend to come back with all sorts of arts and crafts back from. preschool. Washington's hat isn't something that I've seen yet though.